1. On penalty of a periodical payment by way of a penalty (contempt of court) and sanctions on its bodies, the defendant is to be prohibited, directly or through third parties in Switzerland, Germany, Estonia and the Netherlands, from making and offering Premium extractor hoods according to claim 1 of EP 1 234 567 B1, placing them on the market, using them, or importing or storing them for these purposes. 2. On penalty of a periodical payment by way of a penalty (contempt of court) fine and sanctions on its bodies, in case of violation the defendant is to be obliged to recall the extractor hoods according to request No. 1 that it has placed on the market, i.e. to ask all known buyers of the products according to request No. 1 within a maximum of five calendar days to return the products according to request No. 1 in exchange for a full refund of the purchase price and other expenses. 3. All costs and damages, including compensation for expenses incurred by the patent attorney, are to be borne by the defendant. The claimant is a limited liability company governed by Estonian law with headquarters in Tallinn. The defendant is a joint stock company governed by Swiss law with headquarters in Lugano. The infringing acts are being committed by the defendant in Estonia. Therefore the European Patent Court, specifically its regional division based in Stockholm, has jurisdiction to rule on this action for infringement under Article 5(3) of the Lugano Convention and Article 33(1)(a) of the Agreement on a Unified Patent Court. The claimant is a family-owned company. It is a market leader in the field of ventilation technology, specialising entirely in ventilation and airing systems for kitchens. It employs more than 100 staff and has an annual turnover of over EUR 10m. It has subsidiaries and operates at five sites located in Switzerland, Germany, Estonia, the Netherlands and Italy. This action is based on EP 1 234 567 (EP '567 or "the patent in suit"), the application for which was filed by the claimant on 1 January 2010. The patent in suit claims a priority of 1 January 2009. The patent grant was published in the European Patent Bulletin on 10 February 2013. The patent in suit has been validated as a unitary patent and as a European patent in Switzerland, and the renewal fees have been paid. The defendant is a company that deals with household appliances. It develops, produces and sells kitchen equipment. The action has been brought against the defendant offering and selling Premium extractor hoods. 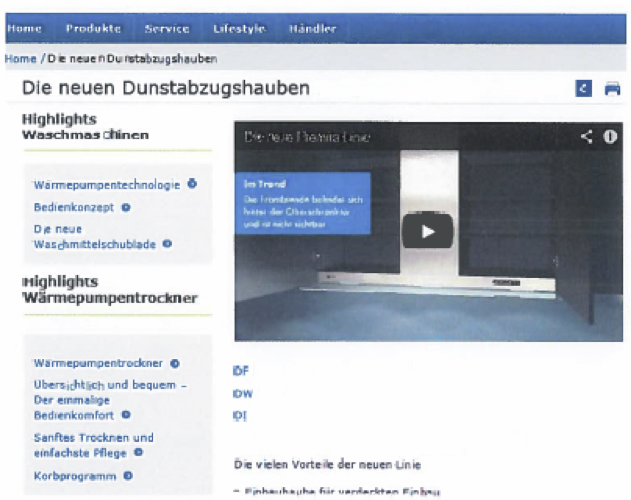 The defendant advertises the contested extractor hoods, among other places, on its website (www.schallag.com), which is aimed at the Swiss and EU markets. The defendant's website currently lists four different Premium-line models among its range of products; prices per device vary between CHF 1 000 and CHF 2 000 depending on configuration. The claimant was first made aware of the defendant's Premium extractor hoods on 17 January 2013 at a trade exhibition organised by the EU Air Extraction Association. 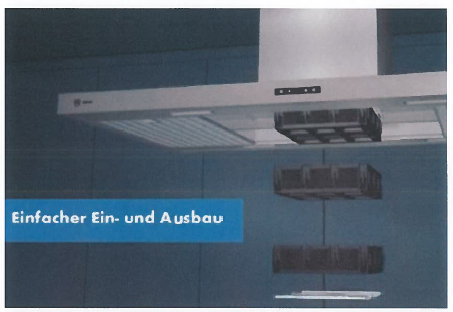 A few days later, on 22 January 2013, the defendant published a press release on its new Premium extractor hoods. 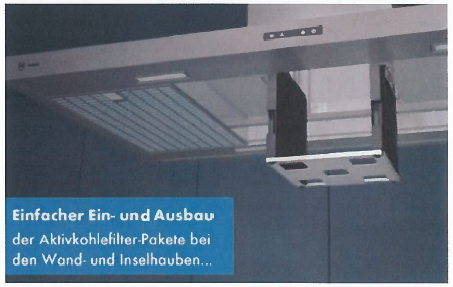 As a simple Google search shows, Premium extractor hoods are already on the market and can be ordered in numerous designs, for example from www.haubenshop.ch or www.dunstshop.ch, with short delivery times (immediately or within five days). 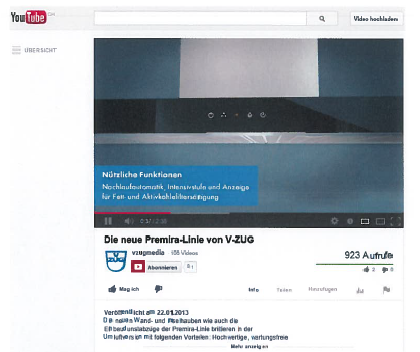 The claimant made test purchases in Switzerland, Germany and the Netherlands, each time ordering one Premium extractor hood. The goods were delivered to the claimant in April 2013. The accompanying documents showed that the hoods were made in Ivangorod, i.e. in Russia but close to the Estonian border. They are packaged there, transported by lorry to Tallinn, shipped to Lübeck and, from there, transported again by lorry to the distributors. 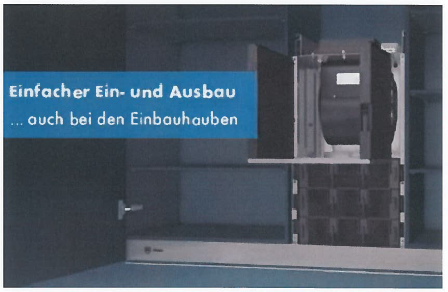 Figure 1 shows an image of the contested Premium extractor hood with its front cover removed to show the inner workings. The centre of the hood holds a ventilator and a motor, which are hidden inside a housing. Upright active charcoal filters are positioned to the left and right of the ventilator. In this figure, there are three blocks of active charcoal layered horizontally on the lower side of the ventilator with its motor. With the Premium devices, as with those of the claimant, the suction housing comes in two different sizes: one size has one floor cassette, the other has three (as shown below). The choice between having one or three floor cassettes basically depends on the space constraints of the kitchen cupboard or the overall height of the room. 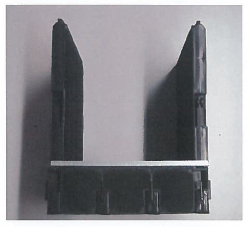 The extractor hood that the claimant ordered from the defendant contained one (not three) active charcoal cassettes underneath. Figure 2 shows how the air is drawn in, on the one hand, through the horizontal layers of active charcoal underneath the ventilator and motor and, on the other hand, through other chambers located between each of the lateral active charcoal filters and the outer housing of the extractor hood, and subsequently through the lateral active charcoal filters, i.e. in the latter case the air is channelled sideways through the upright active charcoal filters. With this figure the defendant points out the air-purifying properties of the active charcoal filters ("Beste Geruchsbeseitigung"). Figure 3 shows how simple it is to remove the active charcoal filters underneath the ventilator and motor. Figure 4 shows the construction of the two active charcoal filters mounted on either side of the ventilator and motor of the contested extractor hood. Figure 5: For extractor hoods that are built into kitchen cupboards, the active charcoal filters can be removed from the front. Once the claimant had become aware of the defendant's Premium devices at the trade fair in mid-January 2013, it checked for possible infringement of the patent in suit, insofar as this was possible with the documents available at that time (namely information about the new Premium product line published on the defendant's website and the defendant's published advertising). This investigation revealed that the Premium product line devices infringe claim 1 of the patent in suit. Mr David Haapsalu, member of the claimant's Management Board, informed Dr Peter Eidgenoss, Managing Director of the defendant, of these facts in a letter dated 11 February 2013, and called on the defendant to explain, by 22 February 2013, why it considered itself entitled to make, offer and/or sell the contested extractor hoods. In its reply, the defendant denied any infringement of EP '567 and, at the same time, maintained that the patent in suit was not valid. The prior correspondence shows that, in terms of patent infringement, the dispute between the two parties is solely about whether, in the defendant's contested extractor hoods, the suction motor is enclosed on the suction side in the suction chamber by an absorption filter (see feature K1b of claim 1 below). This contested feature will therefore be looked at again specifically in more detail after the following comparison of the features of claim 1. Below is an outline of the features of claims 1 and 2 of the patent in suit. which have an inlet side on the underside of the hood. 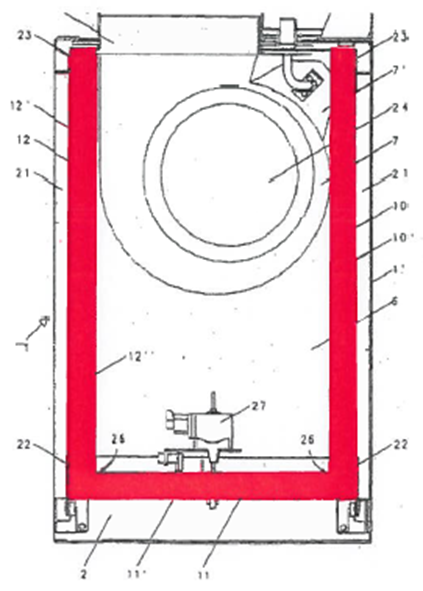 There is also a suction chamber, formed by the four side walls of the extractor chimney and the upper and lower partitions (shown in red in the figure below). A suction motor with ventilator is housed in the suction chamber. Waste air is drawn off through an exhaust path above the suction chamber. The suction chamber contains active charcoal filters. These are typical absorption filters that capture gaseous pollutants. The active charcoal filters enclose the suction motor on the suction side (for more details, see point 35). As already mentioned, active charcoal filters serve essentially to remove gaseous pollutants, in other words to purify air. The claimant's publicity material also clearly states that the active charcoal filters perform an air-purifying function. Due to their physical properties, the active charcoal filters also have a noise insulation function. 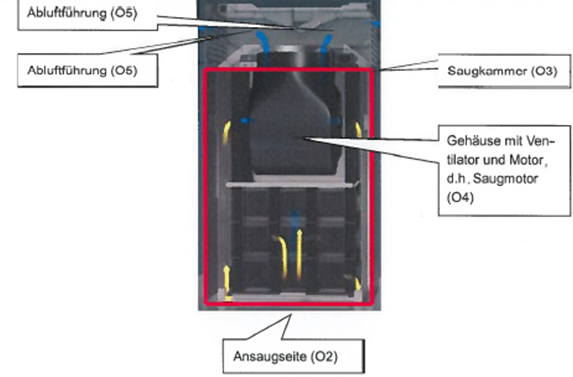 In terms of infringement, as mentioned above, in the defendant's letter of 22 March 2013 only the partial feature K1b is contested, namely the fact that the suction motor has to be enclosed by an absorption filter on the suction side. 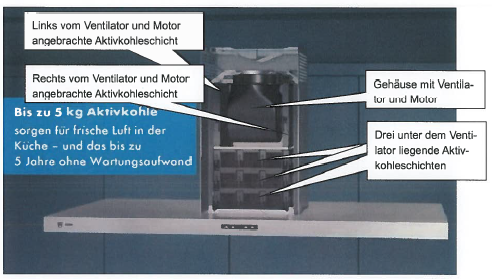 The defendant appears to want to construe the feature "enclosed on the suction side" as meaning that the suction motor has to be completely surrounded by the absorption filter, except the exhaust side (i.e. on five sides). In the defendant's view, this supposedly stems from normal language usage, in that the verb "to enclose" is usually understood in the sense of "to encircle". Furthermore, the defendant refers to paragraph  of the patent in suit, which stipulates that the filter cassettes form a closed space enclosing the suction motor. Although it is true that "to enclose" may also have the specific meaning of "to encircle", an object that is encircled is not enclosed on all sides. A circle does not completely enclose an object, but rather only extends across two dimensions. "Enclosed on the suction side" in the sense of "encircled on the suction side" therefore means that the absorption filter has to encircle the suction motor on one side, namely the inlet side; in other words, the active charcoal filters have to form a semi-circle (or a U-shape) around the suction motor on the inlet side. This is the case with the defendant's contested devices: the two vertical and the horizontal active charcoal filter(s) form a semi-circle (a U-shape) around the ventilator and the motor. 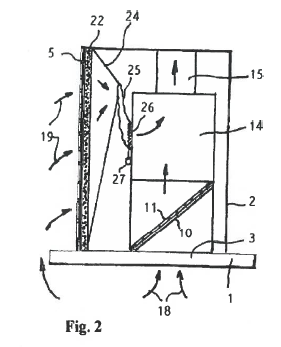 Furthermore, the defendant has overlooked the fact that the embodiment described in paragraph  of the patent in suit, in which the filter cassettes form a space enclosed on five sides around the suction motor, clearly refers to sub-claim 3, which calls explicitly for such a closed space. Claim 1 corresponds to the embodiment described in paragraph  of the patent in suit (specifically the first three sentences), for which there is no such restriction. The fact that claim 3 of the patent in suit explicitly calls for the cassettes to form a closed space enclosing the suction motor thus confirms that a gradation in the scope of protection is defined in the sense that with the verb "to enclose" in claim 1 the scope of protection is defined more broadly, and protection is not confined to "surrounded". If, for example, an extractor hood is fixed to a wall, as described in paragraph  of the patent in suit, it is also clear that no absorption filter is necessary, or it is attached on the wall side. Claim 1 should not therefore be interpreted as narrowly as the defendant would like it to be. In accordance with claim 1 of the patent in suit, it suffices for the absorption filter in the suction chamber to enclose the suction motor on the inlet side so that the absorption filter on the suction side forms a semi-circle or a U-shape around the suction motor, i.e. covers the suction motor and ventilator on the underside and extends to at least two opposing sides and there also covers the suction motor and ventilator at the side. In this way, Premium devices fulfil feature K1b of claim 1 of the patent in suit. 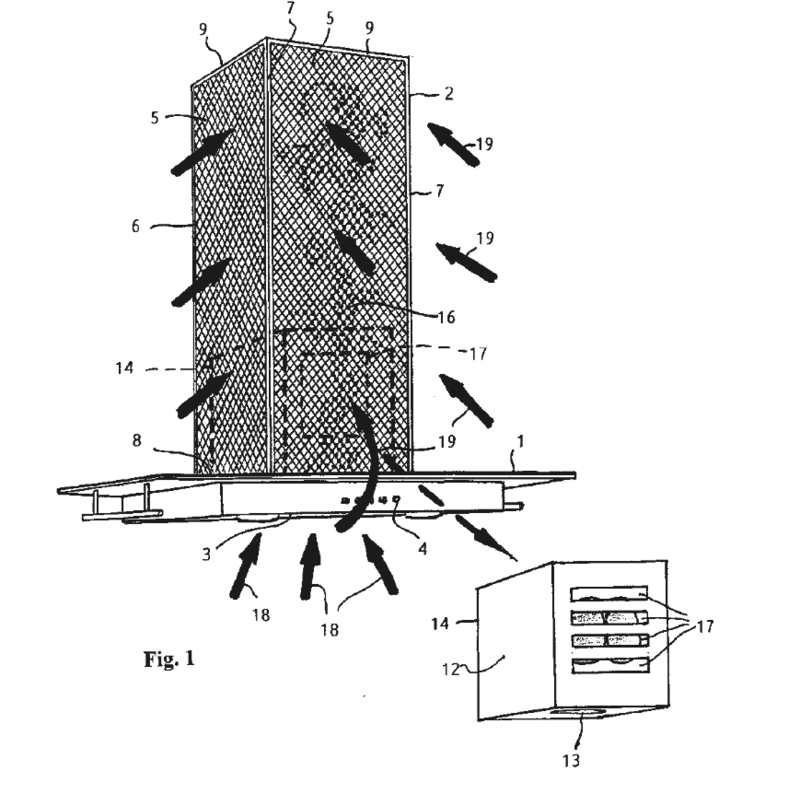 Dependent claim 2 of the patent in suit claims a ventilator device according to claim 1, characterised in that the absorption filter comprises planar cassettes (10, 11, 12, 10a) each filled with active charcoal. In Premium devices, the filters are arranged in planar cassettes and contain active charcoal as the filter material. This cassette design used in the defendant's devices makes it easy to fit and remove the filters. The defendant's data sheets confirm that Premium devices contain active charcoal as the filter material (see attachments 12, 13, 14, 15). Even if the term "to enclose" is interpreted to also mean a U-shape formed within the suction chamber on three sides with filter plates, claim 1 of the patent in suit is novel. The defendant has failed to recognise that there are intermediate stages between dependent sub-claim 3, which requires the absorption filter to form a closed space around the suction motor, and the interpretation underlying the defendant's assessment of novelty, namely that it is sufficient for "only a part of the sides of the suction chamber to be provided with filter plates". Claim 1 forms such an intermediate stage in that it requires the absorption filter to enclose the suction motor on the suction side, i.e. to be present on the inlet side on three sides around the suction motor and to form a U-shape. Thus to the extent that the citations provided by the defendant merely show devices in which filters are fixed to individual sides of the suction motor but do not form a U-shape, they do not destroy the novelty of claim 1, contrary to the defendant's view. Even citations with devices that have filters fixed to the outside of the suction chamber do not, contrary to the claimant's view, destroy the novelty of claim 1. The first patent specification cited by the defendant, EP 1 134 501, relates to an extractor hood which, according to claim 1, has a housing (12) in which there is a blower and the corresponding motor and which should have at least two inlet openings (3, 17). The housing has a first, horizontal inlet opening on the suction side (3) which is firmly attached to the horizontal canopy (1) beneath it and a second or several further inlet openings (17). According to dependent claim 3, the additional inlet openings (17) in the inner housing (12) should communicate with the open inner space of the chimney (2) which projects vertically from the canopy (1) and encloses the housing (12) and itself has an opening (5) for air communication with the environment in at least one of the walls of the chimney housing (properly 2). The opening (5) can be fitted with a filter cassette (22). Figure 1 clearly shows the canopy (1), the inner housing (12) with inlet openings underneath (3) and to the side (17), and the chimney (2). In Figure 2, two filter plates (10, 11) are arranged in the lower inlet port (3), and a filter cassette (22) is arranged in the chimney's (2) lateral air-permeable wall panel (5) communicating with the side inlet port (17, see the smaller-scale diagram in Figure 1) of the inner housing, the air being channelled to the inlet port (17, see the smaller-scale diagram in Figure 1) by means of a tube (25) (see column 5, paragraph ). 1. In EP '501 the inner housing (12), which contains the housing section (14) with the compressor, forms the suction chamber: that is the only place where there is a partial vacuum which causes the air to be sucked in. For that reason, only the grease filter (10) or charcoal filter (11) is located inside the suction chamber. The additional lateral filters (22) are separated from the suction motor by means of the open chimney (paragraph ) or by means of tubes (24) and a dome (25) (paragraph ), but are always located outside the suction chamber. In the patent in suit, however, the air-purifying and noise-insulating filters are said to be housed in the suction chamber itself. 2. EP '501 discloses several suction or inlet openings (3, 17), but clearly defines the suction side as being the side that communicates with the inlet opening (3) (column 5, paragraph , "an opening on the suction side that communicates with the inlet opening (3)"). The inlet openings (17) and the panels (5) and filters (22) in the chimney wall that communicate with them are not therefore located on the inlet side, but rather are at an angle of 90° to it. The patent in suit presupposes that the absorption filters are arranged on the suction side or that they enclose the suction motor on the suction side (and not just anywhere). 3. Through this arrangement of several suction or inlet (3, 17) and filters separated from them and not interconnected (11/12 and 22), no noise-insulating function is sought or achieved; instead, unnecessary air constrictions and turbulences are created, which lead to higher noise emission. By contrast, with the patent in suit the absorption filters are said to enclose the suction motor to achieve not only an air-purifying function but also a noise insulation function. As a result of these differences, the extractor hood according to EP '501 has considerable disadvantages compared with the device according to EP '567. First, having numerous inlet openings (3, 17) with communication via the open chimney is not very efficient, and with the tubes and domes it makes extractor hood assembly laborious and uneconomical. 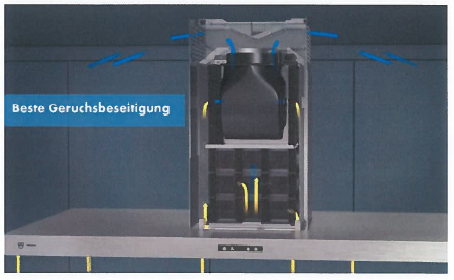 Second, the extractor hood is also very disadvantageous in terms of space and is therefore not in conformity with market conditions, since the enclosing chimney (12) is almost twice as large as the compact suction chamber of the patent in suit. Therefore EP '501 is not novelty-destroying for the subject-matter of claim 1. A patent gives its proprietor the right to prevent any third party from using the invention commercially. In addition to applying and carrying out the invention, "using" also specifically means manufacturing the invention, storing it, offering it, placing it on the market, and importing and exporting it. The claimant has shown that the defendant is marketing and selling extractor hoods in the countries concerned that fall within the scope of claim 1 of the patent in suit. OJ EPO SE 5/2015, p254 - Case study "Extractor hood"